Are you contemplating going to nursing school, or are you actually in nursing school right now? Nursing school can be challenging, especially if you do not know what to expect. 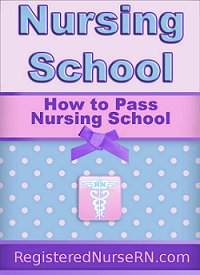 Here is a great guide by S. L. Page BSN, RN called “ How to Pass Nursing School “. This book gives you detailed information about how to pass nursing school from beginning to end. S.L. Page, the creator of this website, complied all the information students what to know about nursing school into one easy to read guide. She gives in depth information on how to succeed in nursing school. Copyright Notice: Do not copy this site, articles, images, or its contents without permission. Enter your email address below and hit “Submit” to receive free email updates and nursing tips. Submit a $50 nonrefundable application fee (check or money order). Submit an essay letting us know your reasons for pursuing the profession of nursing as well as enrollment into our College of Nursing. Submit resume that includes work, healthcare, and volunteer experience. Request two professional references be sent to Admissions. General education courses with a grade of "C" or better from a regionally accredited college or university may be considered for transfer credit provided they meet degree requirements in the College’s curriculum. Courses may be considered for credit, regardless of age of the course. However the age of the coursework is a factor in the admission decision. Science courses completed more than five (5) years ago may require validation by faculty before credit can be granted (for prelicensure BSN Track applicants). An applicant desiring to transfer from another nursing program into the Mercer nursing program can possibly receive credit for nursing electives only (2 semester hours) provided a "B" grade or higher was earned. Minimum 3.0 cumulative GPA, science GPA and transfer GPA: Applicants may be considered for admission if they do not have the minimum 3.0 GPA or the minimum TEAS composite score (76%) on a case-by-case basis.